Goulston & Storrs is pleased to announce that Meghan Hottel-Cox has joined the firm’s Real Estate practice in its Washington, DC office. Meghan joins the firm as an Associate and focuses her practice on zoning matters, sales and acquisitions, leasing negotiations and complex real estate finance work. 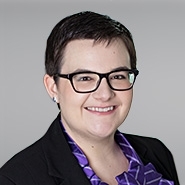 Meghan joins Goulston & Storrs from Arent Fox LLP. Meghan received her B.A. from the College of William and Mary and her J.D. from the George Washington University Law School.